After being shunned by Wall Street and international investors last year, Saudi Arabia made a roaring comeback on Tuesday as oil giant Aramco received more than US$100 billion in orders for its maiden global bond. The order book is set to be the largest ever seen in emerging markets, covering many times the US$10 billion to US$15 billion Aramco is expected to raise. It’s a sign of investors’ hunger for yield in a world where bonds from some developed nations have negative interest rates. The bond sale is largely seen as Plan B to raise money for the kingdom’s economic agenda after the initial public offering of Aramco was postponed until at least 2021 from an initial 2018 target. In effect, Saudi Crown Prince Mohammed bin Salman, who runs the country day-to-day, is using the state oil producer’s pristine balance sheet to finance his ambitions. For Saudi Arabia, the strong demand for the debt of its state oil company will comfort the country’s wealthy royal family, which has been in crisis mode since the assassination of journalist Jamal Khashoggi in October. The murder, which U.S. intelligence concluded was ordered by Prince Mohammed himself, triggered a global uproar that prompted Wall Street banks, investors and business tycoons to give the kingdom a cold shoulder. An investment summit in Riyadh that month dubbed “Davos in the Desert” was mostly boycotted by its A-list participants. Yet, little by little, the power of money has attracted Wall Street again, first at the real World Economic Forum in Davos, Switzerland, where bank bosses said it was time to let the kingdom out of the penalty box. And later in the bond market itself, where the Saudi government successfully raised debt this year. The Aramco bond sale will be final confirmation of the turnaround for the Middle Eastern nation. The company told investors it would sell debt in six portions, from three to 30 years, according to the people familiar with the matter. “The market shows no signs of wishing to balk at the latent political risk attached to Saudi,” said Anthony Peters, a strategist at Blockex Ltd. In London. In a rare development for a state-owned company, Aramco could be on track to pay less for its debt than the Saudi government, the same people said, asking not to be named before the bond pricing later on Tuesday. The anticipated low pricing and strong order book underscores the financial strength of the world’s largest — and most profitable — oil company. In the last few months, only companies such as telecommunications and media conglomerate Comcast Corp. and pharmaceutical giant CVS Health Corp. have drawn similar, or larger, interest from investors. Comcast attracted US$88 billion in orders in 2018, while CVS peaked at what’s consider a record for any company: US$121 billion. With strong demand, Aramco told investors it expects to pay about 1.25 percentage points more than U.S. Treasuries for its 10-year notes, compared with Saudi sovereign bonds trading at about 1.27 percentage points. Traditionally, those risk premiums fall in a high-demand bond sale as the process advances, suggesting Aramco may pay even less. Investors will be watching closely to see how much the pricing tightens at the next stage of the process. Such has been the massive response to the deal, the company has opted not to give any further price indications until after the book has closed, which is due around 11 a.m. London time. This isn’t the first time Saudi Arabia has turned to debt markets since the death of Khashoggi. In January, the nation sold US$7.5 billion in international bonds, the first sign that the outcry hadn’t stifled foreign investors’ interest in the country. Aramco has lined up a roster of international banks supporting its jumbo bond deal, another indication of how the mood in Wall Street toward the kingdom has changed. The banks not only want to participate on the bond sale, but also ensure they’re well placed in case Aramco goes ahead with its planned IPO. Jamie Dimon, JPMorgan Chase & Co.’s chief executive officer, spoke at a lunch in New York Thursday to market the deal, according to one person familiar with the matter. Last year, Dimon and others skipped the investment conference in Riyadh, but still sent senior bankers to make sure they kept their contacts with the kingdom. JPMorgan and Morgan Stanley are managing the bond sale along with Citigroup Inc., Goldman Sachs Group Inc., HSBC Holdings Plc, and NCB Capital Co. An order book as large as US$85 billion indicates that many investors that shunned “Davos in the Desert” are also planning to buy the bonds. 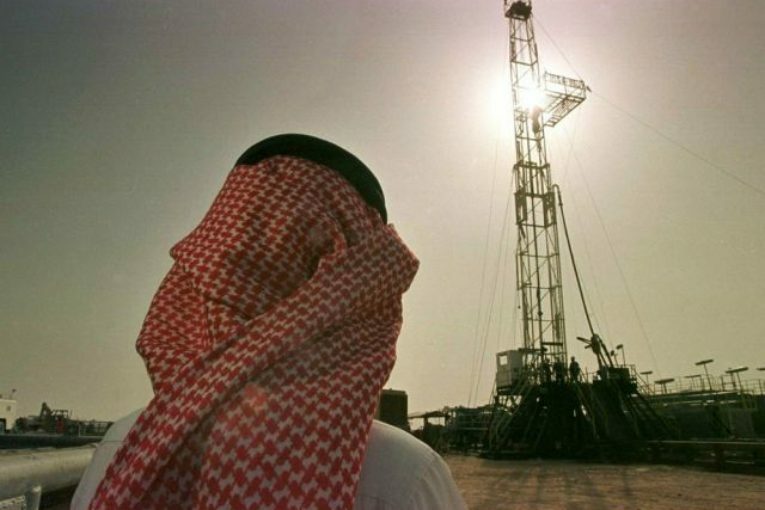 The bond sale, being pitched to investors over the last week in a global roadshow from Tokyo to New York and London, has forced Aramco to reveal financial and operational secrets held closely since the company’s nationalization in the late 1970s, shedding a light on the relationship between the kingdom and its most important asset. Both Fitch Ratings and Moody’s Investors Service assigned Aramco the fifth-highest investment-grade rating, the same as Saudi sovereign debt, but lower than oil majors Exxon Mobil Corp., Royal Dutch Shell Plc and Chevron Corp. The company plans to use some of the proceeds of the bond sale to pay for the US$69 billion acquisition of a majority stake in local petrochemical company Sabic from the country’s sovereign wealth fund. The deal between three government-owned entities — where the kingdom’s sovereign wealth fund sells its 70 per cent stake in Sabic to Aramco — moves money from one pocket of the state to another.